I saw this video of Tom Selleck’s mustache added to lots of famous movie characters. The clip of spiderman with the Selleck just clicked with me and I had to draw spiderman with a handlebar, and since he had a handlebar he needed to be all 1800’s gentlemanly and wear a top hat and be in a bare chested boxing match. 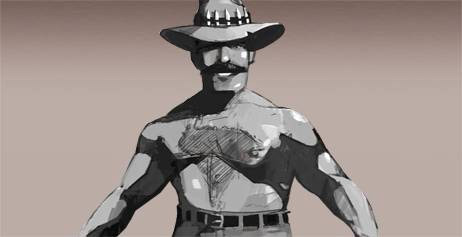 I also took inspiration from Saxton Hale’s Australia shaped chest hair to complete Spidy’s retro manliness.